International Film Series: The Spring 2017 Spotlight on African Women Filmmakers is sponsored by the Department of Journalism & Electronic Media, the Thomas Jay Harris Institute for Hispanic and International Communication, the TTU Humanities Center, and the TTU Women’s Studies Program. 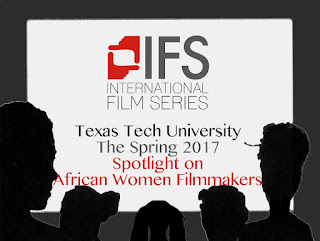 The purpose of the series is to share stories of Africa and women through the eyes of African women filmmakers. The hope is that the spotlight will help to highlight African cinema. The series opened on 24 January with the screening of Sisters of the Screen (2002) with filmmaker and scholar Beti Ellerson in attendance followed by a public talk on 25 January entitled: African Women in Screen Industries: Evolutions, Trends and Tendencies"- see Facebook link here.